Upon the dismemberment of Mercia (1070), a large portion of that district, together with the City of Chester, the whole being formed as the County Palatine of Cheshire, was granted to Gherbod, a Fleming, whereby he became the 1st Earl of Chester. Gherbod returned shortly afterwards to his native country, where he was taken prisoner at the Battle of Cassel (1071) and kept captive for so long that he never returned to England. [CHES311] Hugh d'Avranches vras or le gros or lupus [=wolf] (son of [AVRX301] Vicomte Richard FitzToustain, see AVRANCHES) married Ermentrude (daughter of Count Hughes, see CLERMONT COUNTY), but had an illicit relationship that produced two daughters Geva lupus and Maud. Hugh is generally supposed to have fought at the Battle of Hastings. He became 2nd Earl of Chester (1071), and then became hereditary Vicomte of the Avranchin (after 1082). He founded Chester Castle. At the Domesday Survey, he was tenant-in-chief of land in Berks, Bucks, Cheshire, Derbys, Devon, Dorset, Gloucs, Hants, Hunts, Leics, Lincs, Norfolk, Northants, Notts, Oxon, Suffolk, Somerset, Warks and Wilts. His Cheshire holdings are of interest as they include Rhuddlan Castle and Manor, in North Wales. 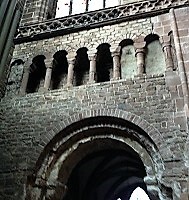 Hugh founded the Benedictine Monastery at Chester (1092), which later became Chester Cathedral (1541). 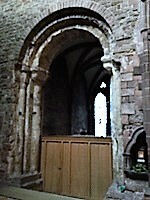 Hugh became a monk at Chester, and died at Chester, St. Werburg, (July 1101). [CHES324] Geva lupus (illegitimate daughter of Hugh) married [RIDE371] Galfrid (see RIDEL). [CHES323] Maud de Abrincis (illegitimate daughter of Hugh) married [SUDE441] Harold (see SUDELEY). [BAYE331] Ranulph de Briquessart le meschin [the young] (born in Briquessart, c.1070, son of [BAYZ321] Vicomte Ranulph (see BAYEUX COUNTY), Vicomte de Bayeux in Normandy, married (c.1098) [THOR338] Lucy (widow, born at Spalding, c.1068, daughter of Sheriff Thorold, see THOROLD THE SHERIFF). Ranulph was Vicomte du Bessin, and became Vicomte d'Avranches (1120), and 4th Earl of Chester (1120). He was Commander of the Royal forces in Normandy (1124). He died January 1129, and was buried at Chester, St. Werburg. Lucy died 1141. [BAYE345] --- (born c.1102, daughter of Ranulph) married [TRIV391] Robert de Treves, see TRIVERS). [BAYE349] Adeliza (daughter of Ranulph) married 1. [HERT441] Lord Richard FitzGilbert (see HERTFORD (CLARE) EARLDOM); then 2. [CUNR421] Robert de Condet (see CONDET). [MESC341] William FitzRanulph (younger son of Ranulph) married [ROMI369] Cecily (Lady of Skipton in Craven, only daughter & sole heir of Robert, see MESCHIN). [BAYE341] Ranulph (born at the Castle of Gernon in Normandy, before1100, son of Ranulph) married (c.1141) [GLOU452] Maud (daughter of Earl Robert, see GLOUCESTER (FITZROY) EARLDOM). Ranulph became Vicomte d'Avranches (1129), and 5th Earl of Chester (1129). Ranulph fought for EMPRESS MATILDA against King Stephen at the Battle of Lincoln (2nd February 1141), in which King Stephen was made prisoner. Later, King Stephen retaliated against Ranulph by seizing him at Court, at Nottingham, (29th August 1146). After pacification, the King Stephen granted him the Castle and City of Lincoln (possibly c.1151). Under his patronage, Basingwerk Abbey was founded (1147). Ranulph died December 1153 (perhaps poisoned). Maud died July 1189. [BAYE371] Hugh de Kevelioc (born at Kevelioc, Oswestry, 1147) became Vicomte d'Avranches (1153), and 6th Earl of Chester (1153). He married (1169) [MONT372] Bertrade (daughter of Count Simon, see MONTFORT L'AMAURY). Hugh joined in the Baronial rebellion against King Henry II, and was taken prisoner at the Battle of Alnwick (13th July 1174). He was deprived of his Earldom, but had it later restored (January 1177). Hugh died at Leek (Staffs) (June 1181). Bertrade died 1227. [BAYE383] Maud (eldest daughter of Hugh) married [DUNK461] Earl David (see HUNTINGDON (DUNKELD) EARLDOM). [BAYE382] Mabel (2nd daughter of Hugh) married [ARUN381] Earl William (see ARUNDEL (AUBIGNY) EARLDOM). [BAYE384] Agnes or ?Alice (3rd daughter of Hugh) married [DERB391] Earl William (see DERBY (FERRIERES) EARLDOM). [BAYE385] Hawise (4th & youngest daughter of Hugh) married [QUER391] Robert (see WINCHESTER (QUENCY) EARLDOM). [BAYE386] Amicia (daughter of Hugh, but does not appear in some lists) married [MAIW451] Sir Ralph (see MAINWARING). [BAYE381] Ranulph (born at Oswestry, in Powys, Salop, c.1170-72, only son & heir of Hugh) became 7th Earl of Chester (1181). Immediately after the Battle of Lincoln he became 5th Earl of Lincoln. He transferred this latter Earldom to his widowed sister [BAYE385] Hawise (see LINCOLN (BAYEUX) EARLDOM).